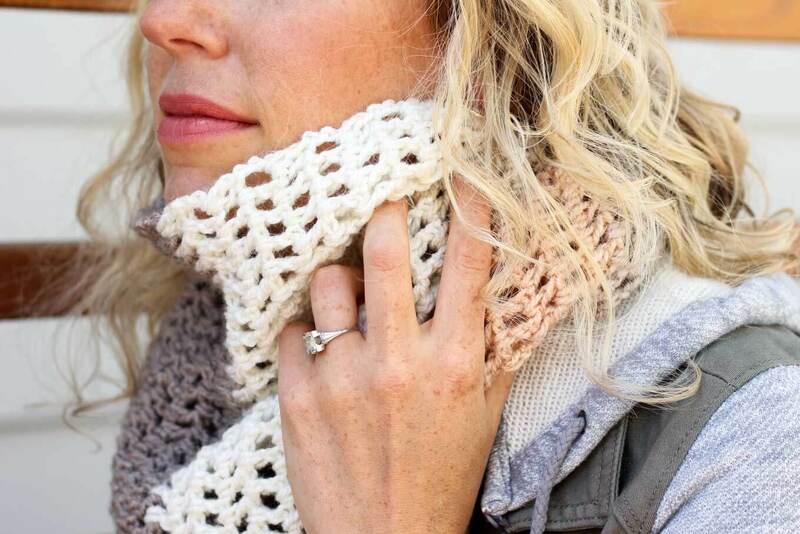 Toss on this modern crochet triangle scarf to head out to the desert, the mountains…or just the grocery store. This free Caron Cakes crochet pattern takes all the stress out of choosing colors because the skein does it for you! Get the free pattern below or download the inexpensive, ad-free PDF here. Fellow crocheters are ALL ABOUT this yarn. Are you one of them? For a few weeks, Caron Cakes was all I heard about on Instagram and in Facebook crochet groups. I watched on, intrigued, but slightly less enthusiastically because I thought all the color options were vivid and bright, and you know, I’m kind of a neutral Nancy when it comes to most colors. Then I found the color way called Buttercream. Oh, sweet Buttercream. I like to eat you, so of course, I’d love to crochet with you! In case you’re unfamiliar with the Caron Cakes hullabaloo, it’s a yarn that’s available exclusively at Michael’s and it has unusually long color runs so you can get nice chunks of color in your project without creating a variegated look. Honestly, the thing I like most about Caron Cakes is that I’m not responsible for choosing the colors. There is no stress like that I feel standing in the middle of a yarn aisle, trying to decide on which colors are going to join the polygamous arranged marriage I’m coordinating for them. I find it so overwhelming! 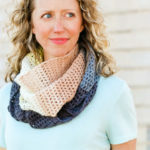 But Caron Cakes crochet pattern takes all the anxiety out of scarf making–just pick one skein and get moving! 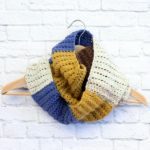 Because this is a one skein crochet project, it makes a really affordable and customizable DIY gift idea. Each time I hold a skien of Caron Cakes in a different color, I think, “Oh, these colors look just like so and so!” It’s so fun to think about which color way most embodies each of my closest friends. 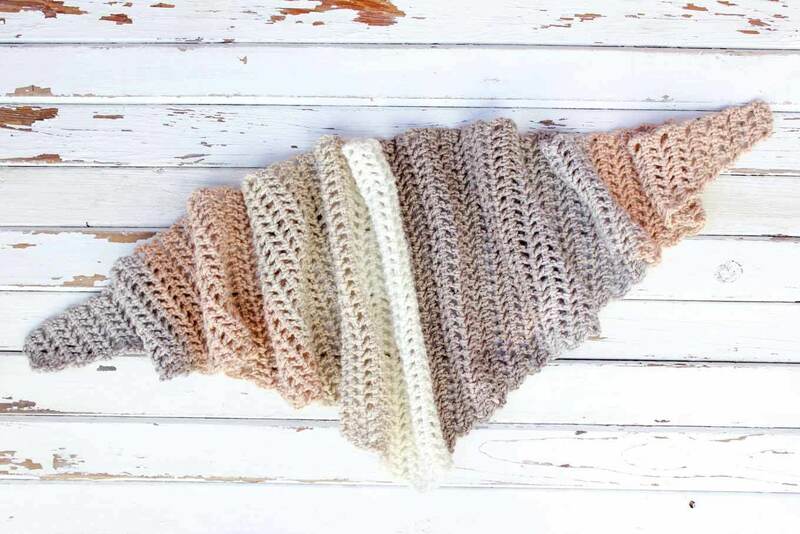 Of course, you can make this triangle scarf pattern in any yarn you choose though! 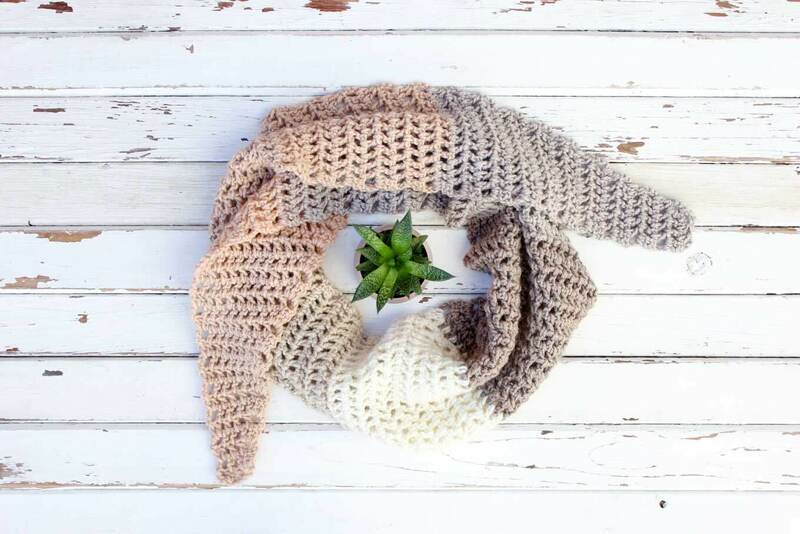 The actual construction of this scarf is quite simple. You just increase for a bunch of rows and then you decrease for a bunch of rows. I know some of you appreciate a chart, so I’ve drawn one below in case it helps you visualize the increases. Please do not publish or share this pattern as your own. You may make items to sell with this pattern. In exchange, please link back to this post. Do NOT use my photos as your own sales photos. ­­Now let’s make something awesome! Download the printable, ad-free pattern for $2.50 here. This scarf is worked from one side to the other by first increasing on every other row and then eventually decreasing on every other row. The increases/decreases always take place on the same side. It’s helpful to put a stitch marker on that side somewhere so that you can easily recognize if it’s an increase/decrease row. Take a look at the order of the colors in your Caron Cakes skein to decide if you want to pull your yarn from the center of the cake or the outside. The yarn color that is at the opposite end from where you begin may not get used. 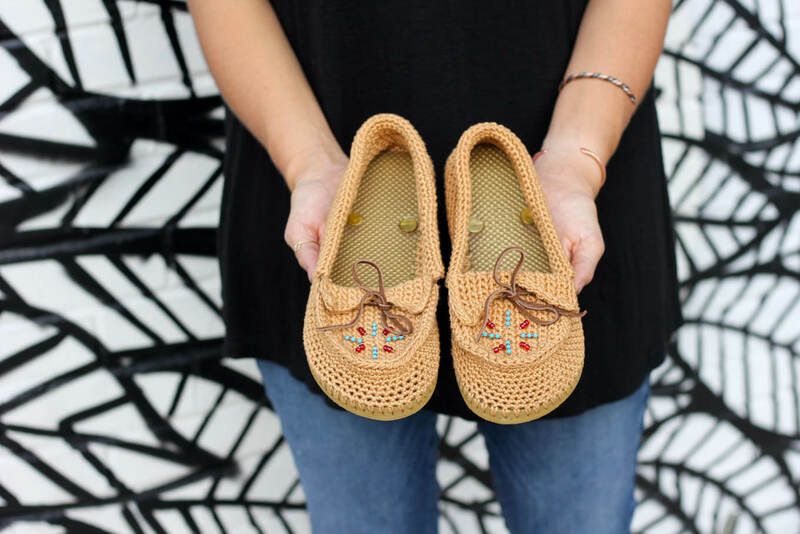 You can use this leftover yarn to make fringe or tassels if you desire. Round 1: 1 dc into sixth ch from hook, 1 ch, skip 1 ch, 1 dc into next ch, 1 dc into last ch; turn. Row 3: ch 4, 1 dc in first ch-sp, *1 ch, skip 1 dc, 1 dc into next sp; repeat from * to end of row, work 1 addl dc in tch; turn. Repeat rows 2 and 3 until work has 32 ch-sp and measures about 33”. End with a row 3. DECREASING – reference photos below for additional help. Row 1 (decrease row): ch 4, 1 dc in first ch-sp, * 1 ch, skip 1 dc, 1 dc into next sp; repeat from * until 1 ch-sp and tch remain, ch 1, dc2tog over next ch-sp and tch; turn. Row 2: ch 4, 1 dc in first ch-sp, *1 ch, skip 1 dc, 1 dc into next sp; repeat from * to end of row, work 1 addl dc in tch; turn. Repeat rows 1 and 2 until 2 ch-sp remain (including tch-sp). End with a row 2. Throw your scarf around your neck, grab your canteen and head to the land of cacti and red rocks! Oh my goodness I love this! Scarves are usually too fluffy for me to wear unless it is COLD out side. I can see this one working with the looser lighter pattern. I’m gonna try this! I just finished my first project with caron cakes and now see what all the hype was about! Can’t wait to try this pattern, thank you for sharing! Haha, that’s how I felt after I used my Caron Cake! There’s something about coming upon the next color in the skein that is just so fun and addicting! I agree!! I”m on my 2nd Caron cake scarf! I love the anticipation of getting to the next color! Thanks so much for sharing this pattern! Quick and easy! Thanks also for the chart! Helps so much! 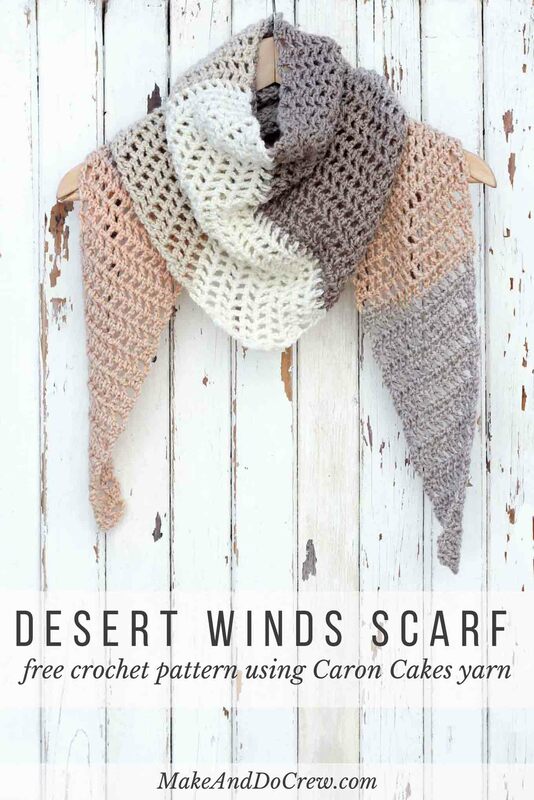 where can i get that Caro cake yarn please ? I absolutely love this scarf! Can’t wait to make it. I don’t normally wear scarves because I get too warm, and they are sometimes too stiff. But this one looks so soft and flexible, and lightweight too! I’m planning to do this exact color as well; it will go with anything! Yes, that’s why I loved this color too! I hope you enjoy this scarf. It lets in enough air, but still adds some visual interest to your neck. I have worked all of the increases and am now stuck on the decreases. Do you begin the decreases on the side with the point? 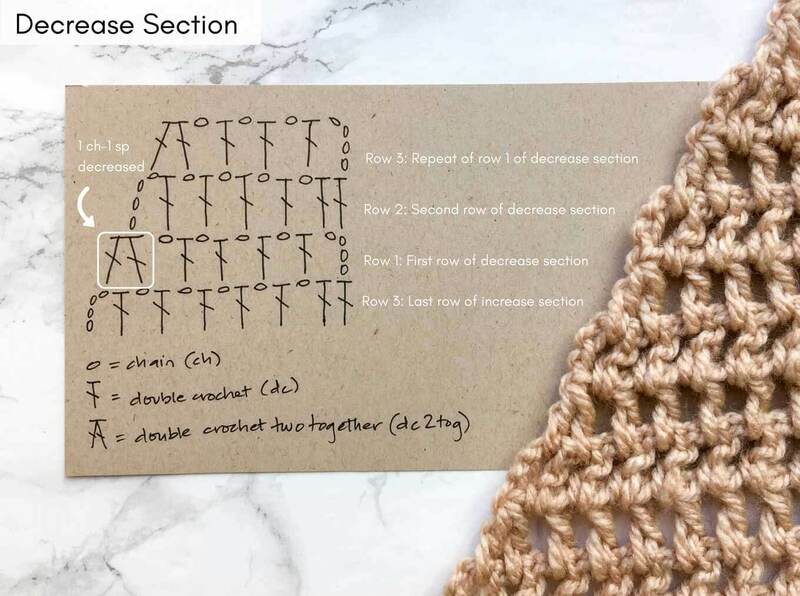 Also the pattern ( if I’m reading it correctly on the decrease row 1) is telling you to make your turning chain 4, then 1dc in the first chain space and then another chain and skipping a double crochet? Should the decrease side mirror the increase side (if the scarf was folded in half)? I’ve tried zooming in on the pics on the tip of the triangle and I’m just stuck. Any help would be greatly appreciated! Thanks much! Yay for buttercream! Yes, it should be symmetrical. So, you’re decreasing on the same side of the scarf you were increasing on, but now you’re decreasing at the end of the row instead of the beginning of the row (like you did with the increases). This is because you work a row 3 at the end of the increasing, so you need to make your way back to the angled side of the scarf to do the decrease. Does that answer your questions? Feel free to ask for more help if not! Im still having a trouble with the decrease, is it possible to show a graph for that? I just answered a comment to Tammy about the decrease, which might be helpful for you to read too. I’m hoping to have time to draw up a chart this weekend! I too am completely stuck on decrease row. I’ve torn out and redone several times and I still have 32 chains spaces. I’ve been a crocheter for 20 years !!! Idk what I’m doing wrong !! 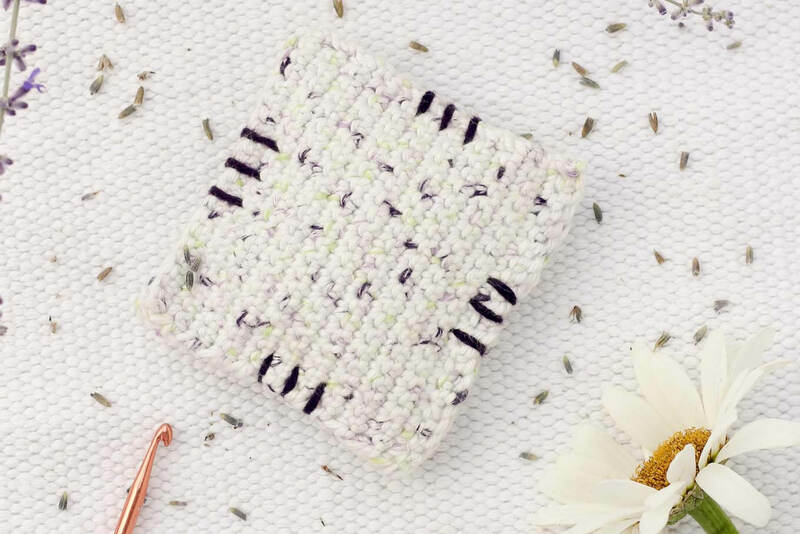 Thank you for sharing this gorgeous pattern! I feel a little like you when it comes to the caron cakes. This color combo is perfect, though. Yum! First off… thank you for sharing your beautiful pattern. I’m really in love with this look and am excited to finish my first (of many?)! Thanks for your note. Let me see if I can help! So you’re going to work the entire decrease row as stated in the pattern until you have two spaces remaining (one “square” from the ch gap and then the space created by the turning chain). Insert your hook in the first of those spaces to begin the dc2tog and then finish it by inserting your hook in the turning ch space. 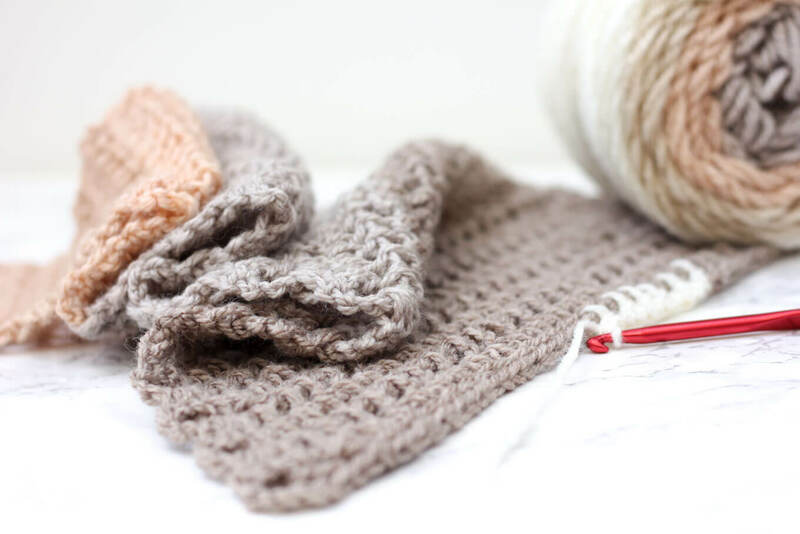 What you’re doing is basically eliminating one of the “squares” or spaces that exists in that row so that it tapers in in the way the other side of the scarf tapers out. The pattern should create a symmetrical scarf. Hopefully I’ll get a chance to draw up a little chart this weekend, but looking at the photo below the decrease section that circles the decrease stitches specifically might be helpful. Got it !! Dang sorry to bother you I was drawing a complete blank.. You answered it just fine when you responded to Tammy… some times my chemo brain gets the best of me. …Thanks again … and have a great weekend. Great! I’m glad it worked out! Love this scarf, I am not using Caron Cake though, I am using the Red Heart Americana. I love it so far. My questions are, is the length suppose to be 33″ or the width? Also, I have ended my increases on 33 spaces, but still don’t have the 33″ length or width, whichever it’s suppose to be. Should I just continue increasing to get the 33″ or should I frog and go to a larger hook size? I’m using an H hook. I just answered your previous message, but I don’t think the hook size is the problem. I’m wondering if maybe you’re increasing too frequently? The scarf is one very long straight edge with a shallow triangle point below it. Thank you, got it. I was doing to many increases. Yay! I’m so glad you got it straightened out, Robin! OMG i love your Scarf and the colours…i bought your Pattern, however i do not get it at all. i have increased in every other row (row 2) and am now with 32 Spaces, but if i start to decrease now, this scarf will be super small. I don’t know what am doing wrong! Please help! One thing that might be helpful is to count your stitches and see how many spaces you’re increasing by each time you increase. You’re right that the increases happen every other row and they should just add one space per inc row. So if you’re increasing more than one sp per inc row, you might be getting to 32 spaces faster than you should be. I don’t know if my other post came through. I will try to remember it. First of all thanks for this cool pattern. Second, I am not using Caron Cakes for this project. I am however using Red Heart Americana. I am loving it for this scarf. I am at the end I think for my increases, but your instructions say that at the end of the increases the scarf should have 32 spaces, I have 33. So wondering if I should be using a larger hook, I am using an H hook now. Regardless, if you happen to have 33 spaces, just work an extra decrease row at the end. Essentially, you’ll know you’re finished when you have the same number of spaces in the last row as you did in the first row. You’re just aiming for a symmetrical triangle. Hi, when doing the decrease row, do you still chain 1 before the dc2tog? Yes–I’m sorry I made a mistake and left that out! It has since been corrected. Thanks so much for asking a great question! I really appreciate people like you that are such astute pattern readers. Beautiful scarf. Thank you so much. I am hooked on Caron Cakes & have made a few things with it. For this scarf, I am using “Faerie Cake”. Looking quite pretty so far. I have completed the increases & working on the decreases now. Like some of the others, I have run into a problem getting it to work properly. I understand the dc2tog & that works fine. Where I get confused is on the start of the next row where you state to do dc in the ch1 spaces. On the decrease row, there is no ch1 mentioned before you do the dc2tog. Do I add a ch1? Or go between the dcs or skip over to next? I hope you understand what I mean. Thanks again for sharing this lovely pattern. I think I do understand what you mean and I think I made a mistake by leaving out that ch 1 before the dc2tog. Thanks so much for bringing it to my attention. It’s been added now. Does that clarify all your questions? Let me know if not! Actually I ended up adding the ch1 & have now completed 2 of these. I made one in Faerie Cake & the other in Red Velvet. Both look great. Now have I have started a third one – also in Red Velvet. Awesome! I’m glad you were such a savvy pattern reader and troubleshooter. I’m so happy you’re enjoying this pattern! I love this pattern and yarn!! I just started working this pattern with the “Buttercream” but my spaces aren’t very well defined. Did you block your scarf to get the large spaces? 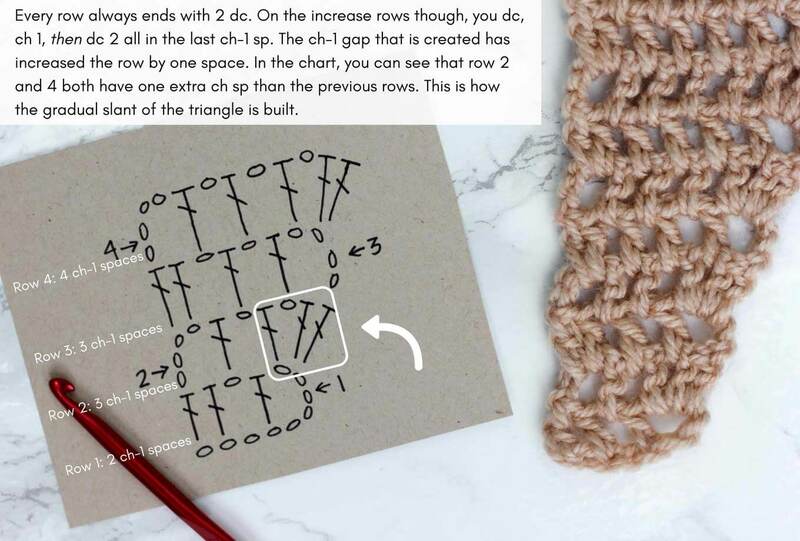 Or maybe I’m doing my double crochets wrong (I am new to crochet)? My stitches are very tight with my dc not very vertical, they look more like “Y’s”. 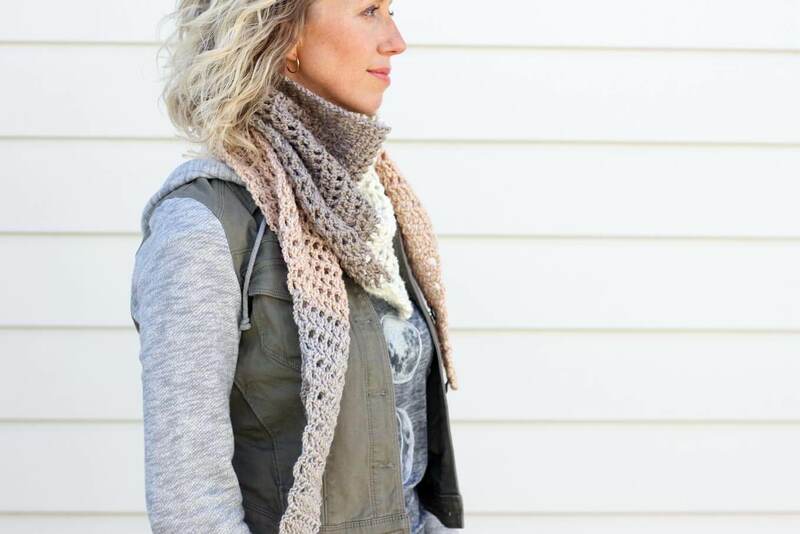 Your advice would be greatly appreciated, I love the look of your completed scarf. You can totally email me a pic if you want me to take a closer look at your stitches. But this video by Moogly might be helpful to you. I didn’t block my scarf, so I’m thinking it sounds like something is not quite right. I am having the same problem as others that the scarf is not as long as it should be when ready for the decrease. I am only increasing on the one side and the other is straight as an arrow. I love how your scarf looks but I am just not getting as long of ends as it show on the picture being worn. I stopped at 32 chain spaces before the decrease am I understanding correctly? Should I just carry on until it looks long enough before decrease? Afraid I will end up with too much bulk in the front. It looks like you answered this question above but I am still unclear because I am not increasing on both ends. It might be helpful to count your chain spaces in each row to see if you’re maybe ending up with an extra one in each row? (Like maybe somehow increasing by two of them instead of one each row.) That could explain why you’re ending up with 32 before your scarf is long enough. Also, have you looked at the chart above at all? Sometimes a chart helps me visualize where the increases go a lot more easily than reading the written pattern, so it might help to have a look at that. I have read and re-read the pattern. I am too wide with 32 spaces and not long enough. I am increasing every other row. Please help. Would you like to send me a pic so I can help diagnose what might be happening? I think what I’m understanding is that maybe your scarf is increasing too quickly? One thing that might be useful is to count your spaces each row for a little while to make sure that you’re only ending up with one increase each time you do an increase row. Thanks for the great pattern! I made it with Boston Cream and put tassels on the ends. So cute! I bet that is adorable! I love the idea of adding tassels! Like some of the others though I’m having an issue and now after reading the comments I’m not sure if my issue lies in the increase side or the decrease side. The increase side has a sharper slant (if that make sense) and the decrease side has a much wider slant, so when I fold the scarf in half it is not matching up. Any thoughts on what’s going on? The slant should be pretty slight with both sides, so I’m guessing the issue is on the increase side. Have you checked the chart to see if you’re increasing in exactly the way it specifies? You should be increasing by one space each time you increase and decreasing by one space each time you decrease. If you count as you go, you might figure out what’s going wrong. 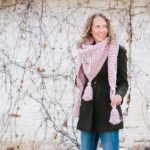 Lots of people have posted their successful projects on Ravelry, so you might check out the photos there in case seeing more versions in addition to my photos is helpful. Am I mistaken or are rows 2 and 3 the same? Thanks. So, row 2 I do the D.C.’s in the actual chain and row 3 works the D.C. In the ch 1 space? I’ve been doing all stitches in the chain spaces…should I be doing roe 2 in the actual chain? I’m so confused ? That dc2tog is where you should be starting a dc in one space, then finishing it in the next space (the turning chain), thereby decreasing one stitch overall. If you’re not familiar with dc2tog, you might want to watch a quick video because I think seeing it in action might clear things up! ..so the decrease is happening on either side of the last dc post. I have started this and only did 30 chain spaces before my decrease and can’t finish because I am out of yarn. Not sure what I did wrong. Please help. Are you at least close to the end of the pattern? 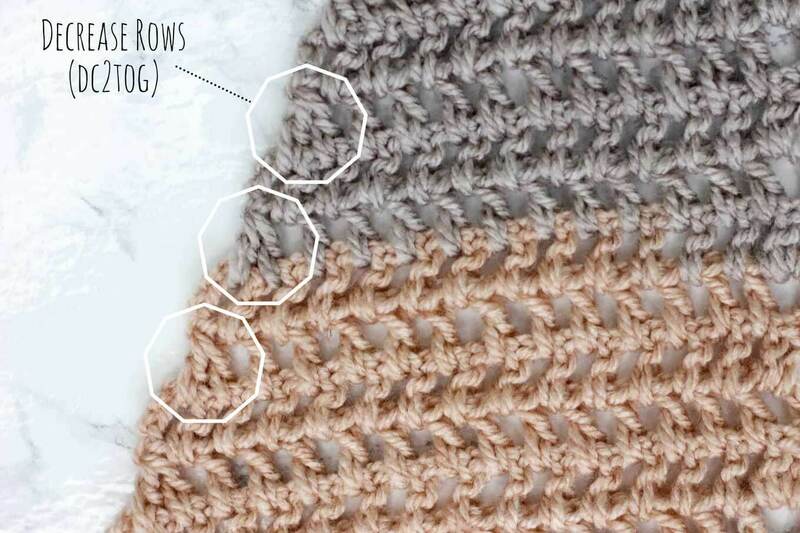 You might be able to do extra decreases to taper your triangle quicker and get to the end with enough yarn to finish. I don’t think it would be very noticeable once the scarf is wrapped around your neck. I’m sorry though, I know that must be annoying. I’m sorry I can’t offer more explanation. I’m having so much trouble with the decreasing if you could please help. Have you counted to make sure you’re decreasing by one space on each decrease? Like you have 32 spaces, then you have 31 spaces. I need a little more info about what exactly you’re struggling with in regards to the decreases to be able to help, but I’ll def try if I can! I am finishing my fifth shawl with your yarn, Christmas gifts! I am sure my family will love them. I love working with your yarn! Uggghhh, having trouble with this pattern…and I refuse to give up, I love it, and everyone comments on how easy it is. May I send you a photo to see if you could correct my problem? How do I send you one? Thank you for sharing this pattern! I’m working it with Caron cakes Rainbow sprinkles and it looks great!! Pattern is so easy to follow. Started this morning and am about 1/2 way thru decreases. Very pleased ! Woohoo! I love those projects that you can get almost immediate satisfaction from! Please post a chart. I am having major trouble with the second section where you decrease. I have read the post and still cannot figure it out. I have took it apart 3 times and am ready to give up. Thank you. I’m sorry you’re having trouble. I will draw up a chart and add it to the pattern post as soon as I’m able! Hello! Is it ok, if i am at first 18-20 rows and my scarf is scrolling a bit? Or maybe i am not doing something right? What do you mean my scrolling? I’m not sure I understand. Hi Jess: I am not sure where I went wrong!! I ended up with 4 points. The middle section being 22 inches wide. Length is abut 52 inches. I could live with that but then it is not long enough to wrap around my neck like your picture which I so wanted it to do. After reading all the post, I am not sure if the problem lies in the increase or the decrease. Could you maybe post a chart for the decreases? Thank you. Hi! 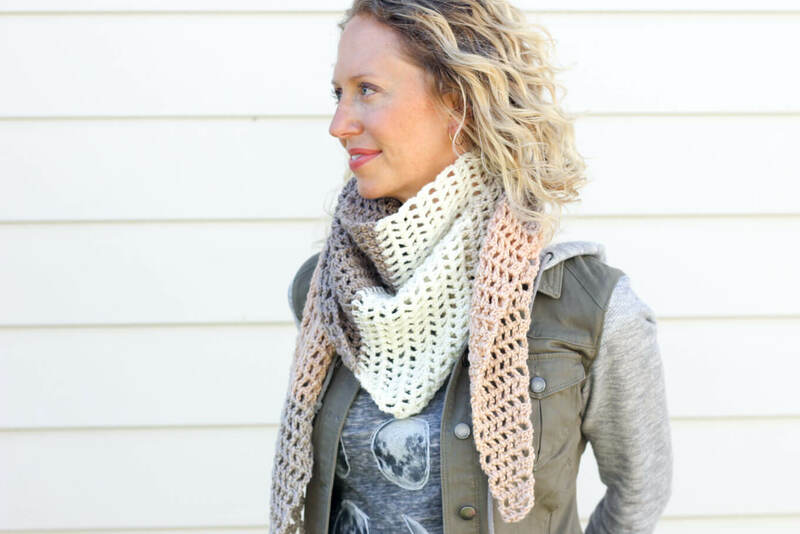 It would be so helpful if you made a YouTube video to go along with this pattern! I see I’m not the only one having troubles! I am a new crochet-er. Can I do this or is it too difficult? I am worried since I see so many questions about the size, shape, and instructions. What do you advise? If I were you I’d take a look through the pattern and charts and see if it generally makes sense. If so, I’d def give it a go! Keep in mind that the comments you see here are from the people who have had questions along the way. There are hundreds of people who have made the scarf with no issues and therefore didn’t leave a comment. 🙂 If you’d like to see some people’s finished scarves, you could check out the pattern on Ravelry. Well, the first half of this scarf went fine, but the second half (decreasing) took me four tries to finally accomplish. I think it came out well in the end. I ran into the same troubles expressed by others and had trouble understanding the instructions. So glad I read the comments section because there I found the answer to my problem. Now I have it figures out and will surely make more as gifts. Thank you so much for sharing your pattern! I’m so glad it worked out, Cynthia! I hope to make a video tutorial of this pattern in the next few months. It would be wonderful if you can find the time to do the tutorial Jess. 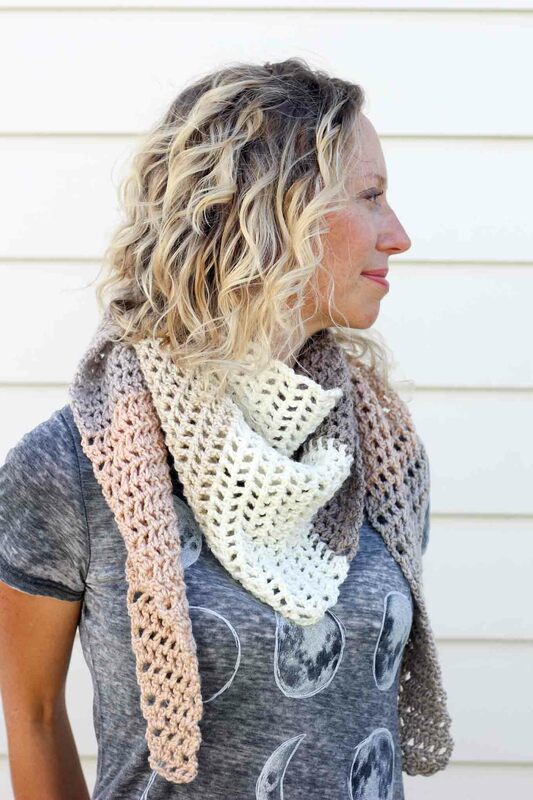 With that, I feel pretty sure a LOT more people will be making this lovely scarf! Again, thank you for sharing your patterns. Hi there! I just wanted to thank you so much for this pattern, I started my scarf yesterday and am hoping to finish today. I can’t wait to start wearing it, it’s so pretty! (I have Faerie Cake) Now onto the question, I am wondering if you blocked this project or just started wearing it right away? My apologies if you’ve already answered this question in the comments, I didn’t check… But if you did block it, how did you go about it? If so, this would be my first blocking so I want to do it right! Thanks a bunch! I’m excited for you to start wearing it too! I didn’t actually block mine. If you wanted to though, I’d use T-pins to pin it to a blocking board, a piece of cardboard or even a towel on your carpet (that’s what I do, but I’m not sure it’s the best idea for the carpet 🙂 and then use an iron on the steam setting to shoot some steam onto the scarf. Keep in mind you DON’T want to actually touch the iron to the yarn. And shooting the steam too directly to the yarn can “kill” the acrylic yarn. Sometimes people do this intentionally because it can make the yarn really soft and drapey, but it also looses some of it’s substance and ability to hold a shape. I just want you to know about what can happen so there are no surprises. 🙂 You can google “How to block acrylic yarn” for lots more details if you’re interested! Hi Jess. It’s me again… And I’ve somehow seemed to run out of yarn… The increase half looks amazing! Then the decrease half just gradually, ‘takes it’s time’ to get to the last 2 ch spaces… But I only made it to 4 ch spaces until I ran out of the yarn. Something is off for sure, I assume on the decrease side. (I will fully admit I may be crocheting quite loose, but I didn’t think it was THAT loose to run out of yarn.) I hope I don’t have to frog it too much, but we all can’t deny it wouldn’t be the first time frogging a project. HELP PLEASE! -More frogging: tear it out to the last few rows of the increase section so that you start decreasing when you have like 30 ch-1 spaces instead of 32. That would save you a little extra yarn for the end. I am trying to figure out the difference between row 2 and 3. You said that one was in the space and the other in the chain. Is this in the actual chain? I have reached 32 spaces and I’m only about 15″.long ? The difference is that row 2 is worked into the beginning chain. Row 3 is worked into row 2. It wouldn’t be accurate to say “repeat row 2” because you won’t be working into the original chain after that first instance in row 2. First, thanks so much for this wonderful pattern. I bought my first ball Caron cakes without a plan of what to do with it. That’s when I found your blog. Also, I’m a “new” crocheter, having just started last year. I’ve knitted for years but wanted to learn crocheting. I’m needing a little help. I’m literally coming up short on my scarf. I’ve read all the previous comments and replies. I’ve just finished counting my rows, hoping that I had increased too fast but all I found was that I only had a couple of rows that were just a repeat of the previous row (count wise). My scarf measures 49″ x 13 1/2″ I used an “H” hook. Any advice? I’m determined to get this down. I’ve already decided to rip the whole thing out and start over, once I find a solution. Is there a chart for the decrease? Like so many others, I am totally confused about the decreasing. I have read and reread all tbese comments, and I am stumped. Maybe if I saw a diagram, it would click for me. I can’t make sense of the photo either. I don’t have a chart right now, but I will try to get one added to the pattern this week! I have made three items using this patter, all of different yarns and weight. Everyone of them turned out incredible. Absolutely love this pattern. Thank you this fantastic pattern!!! I have made a few, all in different colors. I love each new owne better than the last! I love hearing that Angela! Thank you for saying hello! The colors can get sort of addicting can’t they? I just want to try every single one! I am quite liking this pattern! I would like to use most of this cake for this scarf. Just wondering if I could go to 35 or 36 spaces instead of 32? I tried making it before using lion brand ice cream but didn’t have enough to make the 32 space scarf. I would hate to be short wool. I am enjoying this pattern so! I wish my local Michael’s carried a larger color palette. However, JoAnn’s carries a similar product called Sweet Roll. I’ve made 2 scarves in 2 days from both products. Love the scarf and color. Unfortunately that color is no longer available. I found something similar in Bernat Pop! Having trouble with increase. I’m already at 24 spaces – 13″ deep and 25″ wide. Do I need to drop down a hook size? Also I noticed you indicated row 2 end was worked into the chains and row 3 in the space. However the instructions for row 3 say work 1 addl dc in tch. I’ve enlarged the sample next to the increase chart. It looks to me as if both rows are worked into the space at the end. Please advise. Thank you! It sounds like you might be about on track for the gauge size width-wise, but a little looser than the gauge for the height of the scarf. I think the sizing will work out in a pretty wearable way, but I can’t speak to if you’ll end up having enough yarn. Sizing down would probably ensure enough yarn (assuming Bernat Pop! is similar to Caron Cakes in yardage), but I’d hate for you to have to frog all your work unnecessarily. Thanks for the feedback. I’ve worked with both yarns now. I think Bernat Pop! may be a bit thicker. I’ll probably frog! Guess it’s just a matter of terminology as far as working into chain. To me that means working stitches into the actual chain, not the chain space. My piece looks exactly like the sample pic so I’m good. Now to get the gauge right. Patience is a virtue, right! Hey there! Thanks for all these awesome patterns! I am having trouble decreasing on the desert winds scarf. I’ve tried it 4 times and it just doesn’t look right! You wouldn’t happen to have a video tutorial on how do achieve this, would you? Have you taken a close look at the decrease chart? I know that comparing that with the written instructions has helped some others who hit some speed bumps. I’ve stared at the pattern and notes for so long, I’m dizzy. But I’m no quitter! 8th times a charm! 😉 I’ll figure it out. Sometimes, I just need to walk away for a bit lol Thanks, Jess! I love this pattern and am crocheting it in the Cake Pop color. I know that Bernat and Premier have similar yarns now, so it’s tough to choose colors! Thanks for the charts you did, as those helped me figure out the increases and decreases without once having to frog! There are SO many good colors on the market now, aren’t there? I love it! Has something changed with this pattern. I made several last year and I found it quite easy. I’m looking at this pattern now and something seems “off” with row 2. What am I missing? Welcome back! Hmm…no, nothing has changed except for I’ve added some additional photos and charts to try to make it easier for visual learners. Is it working better now for you? I am on the last few rows of my scarf in the Buttercream colorway and I totally LOVE it. Unfortunately, it is a birthday gift so I have to let it go to my sister in law. She will love the colors and pattern too. My first increase/ decrease project. Worked up perfectly. Thanks for this modern looking pattern. I truly feel that the right yarn/colors make the project and since I’m new at crochet (Thank you YouTube!) I am a better copycat than creator.. Thanks for being here. Thank you so much for your kind feedback. I feel honored that you spent time with my pattern and made something you’re happy with! I’m sure your sister-in-law will love it too! Thanks for this. Looking forward to starting this weekend. Quick question: I bought a 383 yd skein of Caron Cakes (Berries & Cream). How long do you suggest I increase before I start to decrease. For the 315yd skein, you suggest ’til its about 33″ across. I’m okay with it being bigger. Your thoughts? Since your skein is not significantly bigger than what I used, I’d maybe just add one additional row in each direction before you start the decrease (so two total extra increase rows). Then you’ll do two extra decrease rows. You might be able to push it more, but I’d hate for you to run out of yarn at the very end! Thank you so much for the lovely and easy pattern! You’re welcome, Olga! So glad you enjoyed it! Very deceiving, not surprised to hear others had problems w/decreasing directions. The decrease side of scarf does not look symetrical to the increase side. There was not enough yarn to finish off w/tassels. Also disappointed that I had a problem downloading the pattern when I purchased, asked for help & rec’d none! Good luck! I’m sorry you had trouble with the pattern. The increase and decrease sides are indeed identical. I can fold the scarf in half and they mirror each other. I love the idea of tassels as well, but the pattern wasn’t written to necessarily written to leave enough yarn leftover to accommodate them. I’m also sorry to hear you didn’t receive the help you needed when purchasing the pattern. That’s never my intent. Such a beautiful design! The neutral colours will go well with everything! I’ve made two of these now and I’ll probably make tons more! I crochet tightly, so I added a few rows to reach 33″ before I started decreasing. I still had yarn left over, and the scarf looked great. I didn’t have problems with the pattern, but I added another double crochet in the turning chain after the DC2TOG, which made mine look more symmetrical. I usually have to tweak something in patterns like this to accommodate how tight my stitches are! Thank you so much for sharing this! It’s my new favorite scarf pattern. Michelle I believe you fixed this patterns problem! I must crochet very tight! I’m at 36 spaces and I’m only measuring 30″. My point is right at 14″ though. I double checked and I only increased 1 every other row. I hope it will be long enough! Did you ever make a video for this scarf? I see it was planned several times but I don’t see a link for it. OMG!!! I made this scarf last night for a stocking stuffer!!! Idk if she is going to get it now 😉 JK!!! Totally making myself one though!!! Super easy to follow instructions!!! Thank YOU!!!! Absolutely love the pattern, is there a video for it? I’m not really good at reading patterns. This is the first thing I’ve ever crocheted, and it turned out wonderfully. The photo was vital to my success – being a total newbie, I wouldn’t have understood the written instructions alone, so thank you for including it! Can I send you a picture of my project? I have messed up and cannot tell where/how to fix it. Also, I am at the row where I have 32 sc, and I am supposed to start decreasing. I do not have 33″. Only about 26″. Should I use a bigger hook? Sure, send me a pic if you’d like!